Justin Leonard is a golfer. When Marge told Bart and Lisa to stop watching Trans-Clown-O-Morphs, they switched to a channel that was showing a golf match. Justin Leonard was seen on the green, carefully lining up his putt. According to the voice-over commentator, if Leonard made the putt he would be par for the hole and tied for sixth place. The actual putt wasn't shown. 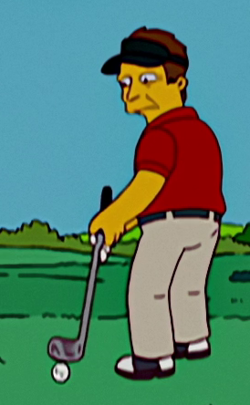 However, immediately after Leonard's shot there was apparently a commercial, because Bart and Lisa then burst into the kitchen, Lisa asked Marge to buy them a Calloway titanium perimeter-weighted driver, and Bart chimed in that the driver would add yards to any swing. Marge grumbled that the kids were being bombarded with commercial images. To distract them from the ads, she asked Lisa to help her with a baking project and sent Bart on an errand with Homer. Modified on January 25, 2014, at 16:27.